Hiring? Toptal handpicks top Apple developers to suit your needs. As a veteran tech writer, Nermin helped create online publications covering everything from the semiconductor industry to cryptocurrency. The Apple Watch went on sale earlier this month and the jury is still out on what it means for the industry. One thing is certain – it’s outselling Android Wear devices by a wide margin, so well done Apple, everything is going according to plan, right? While the Apple Watch is on track to be a commercial success for Apple and its shareholders, technologists are still not entirely convinced smartwatches have what it takes to conquer the market, at least not yet. What does this mean for Apple developers? What are the implications for other platforms and companies behind them? I’ll start with a few dry numbers and market forecasts, just to give you an idea of the smartwatch and wearable landscape, so please bear with me. Research firm IDC expects that, globally, wearables shipments will hit 45.7 million units this year, up from 19.6 million in 2014. By the end of the decade, IDC expects shipments in excess of 126.1 million units. This sounds huge, until you consider that the same research firm expects smartphone shipments to reach a staggering 1.4 billion units in 2015. Apple Watch orders on the first day of sales reached almost one million units in the US alone, which means the device overtook all Android Wear devices combined, in a single day, in a single market. One in 300 Americans ordered the watch as soon as it was available. This alone should be enough for developers to start questioning Google’s platform, but the figures don’t paint the full picture. The Apple Watch didn’t get very good reviews. The entry-level Sport edition made up the bulk of launch orders. Bigger 42mm version is selling much better than the smaller one. Interest for the Apple Watch is waning in some key demographics (namely teenagers). The vast majority of orders came from people who buy Apple devices on a regular basis. Analysts were not impressed and many have slashed their forecasts. It is clear that the product is off to a good start, but it could have been much better. So, let’s take a look at what is behind these issues. Reviewers criticised poor battery life and lack of use-cases (ie no “killer app”). Battery life concerns also explain stronger demand for the 42mm model, which features a bigger battery. Soft demand for high-end models indicates that they are overpriced, which also explains why young people aren’t too interested. The Apple Watch is designed solely for iPhone users – Apple has a huge market share in the US, but not in the rest of the world. Performance of first generation third-party apps is not good. They take too long to load and can be unresponsive. Bottom line – if anyone tells you Apple will conquer the smartwatch market and kill all competing platforms, I suggest you do a bit of research and look at other opinions. It’s true that Apple will outsell Android Wear vendors by a wide margin in the short run, but it will also reach saturation point much earlier. Growth potential is limited by Apple’s own closed ecosystem and premium pricing. 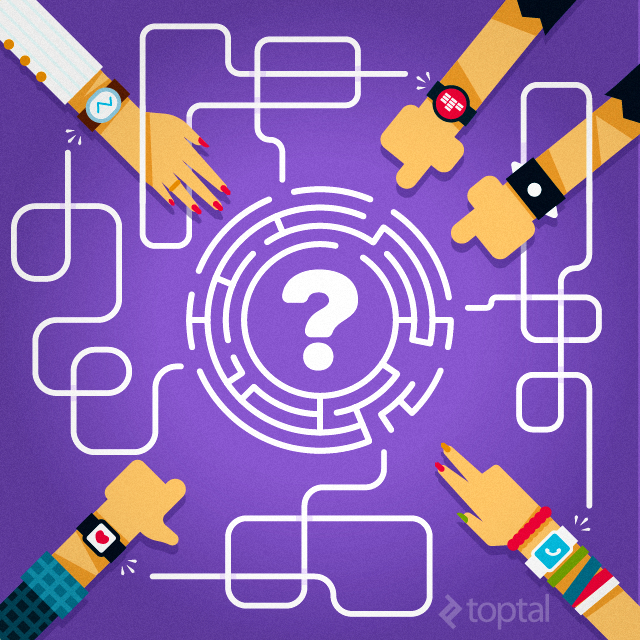 Should you consider smartwatch app development for Apple Watch? By all means. Even if the 1.0 version is not too impressive, the Apple Watch won’t be a flop and we will see the current model, as well as subsequent generations, on millions of wrists. For an in-depth look at Apple Watch development, you can check out this Apple Watch development tutorial, authored by Toptal iOS developer Antonio Bello. Android Wear was announced more than a year ago, in March 2014. The first devices started shipping a few months later, but this first generation of Android Wear products didn’t do well. Upmarket designs like the Moto 360 and LG G Watch R appeared in late 2014, but didn’t help much. Overall, it is estimated that a total of 720,000 Android Wear devices were shipped in 2014. Apple sold more watches in a single day than all Google partners in almost a year. Lack of polish – the OS felt like a work in progress. Lack of functionality – Google failed to integrate crucial features in the first release. Inefficiency, battery life – subsequent updates greatly improved battery life on some devices. No customisation – while most Android phones ship with custom UI skins, Android Wear does not support them. To be fair, Google addressed some of these problems over the past 13 months, but it also gave the platform a bad reputation, which may take time to overcome. Worse, Google’s botched Google Glass project disillusioned many developers keen to embrace the latest Google platforms, only to see the project ditched before it was commercialised. If a dev team was burned on Google Glass, it’s understandable they may think twice before taking the plunge. The good news for Google, and developers interested in Android Wear, is that the platform does have growth potential; compared to Apple Watch, more form factors are available from some big vendors. The latest Android Wear update goes a long way toward ironing out a number of teething problems, and adding new features like WiFi support. Prices are much lower and the potential user base is much bigger (Android Wear hardware will obviously work with the latest releases of Android, but Google is apparently working on iOS support as well. If industry rumours are to be believed, Android Wear could get iOS support by mid-2015. While Android Wear smartwatch development is straightforward, and Google is doing a lot to make it even easier, it remains unclear how iOS support will be implemented. Technically it is possible, and should not be too difficult to pull off, but from a business perspective, Apple would clearly have a vested interest in keeping Android Wear devices uncompetitive. I doubt Apple would resort to drastic measures that would amount to an outright ban, but I suspect Android Wear hardware on iOS will suffer from limited functionality. Yes, you will probably be able to use an Android Wear watch paired to your iPhone in a few months, but you won’t get nearly the same level of integration and functionality as you would with an Apple Watch. Still, this may be a trade-off many users will accept. The Apple Watch doesn’t exactly offer much in the way of unique features, so they wouldn’t be missing out on much. The prospect of limited functionality probably won’t be enough to dissuade many consumers from using a much cheaper device in lieu of the Apple Watch. While analysts and shareholders should be concerned about the lack of use-cases and killer apps for smartwatches, this is actually good news for developers. You could be the one to undertake such smartwatch app development, and make a mark on this emerging and untapped market. I have already talked about long-term forecasts, and the potential is clearly there. And, while we are still in the very early stages of smartwatch development, I believe this niche is worth exploring. It’s not just for risk-takers, it’s not speculative, at least not much more speculative than any traditional mobile app project today. As the segment matures and the user base grows, the lack of use-cases and killer apps will be addressed by the invisible hand of the market and supply and demand. It may take a while, but we could go from virtually no smartwatch apps to a new bubble in just a few years. The bottom line is that Apple Watch and Android Wear smartwatch development will be a big thing in the years to come, perhaps not as big as smartwatch apps, but significant nonetheless. Of course, it’s not just about smartwatch-specific apps; the biggest challenge is adding smartwatch integration to existing apps. 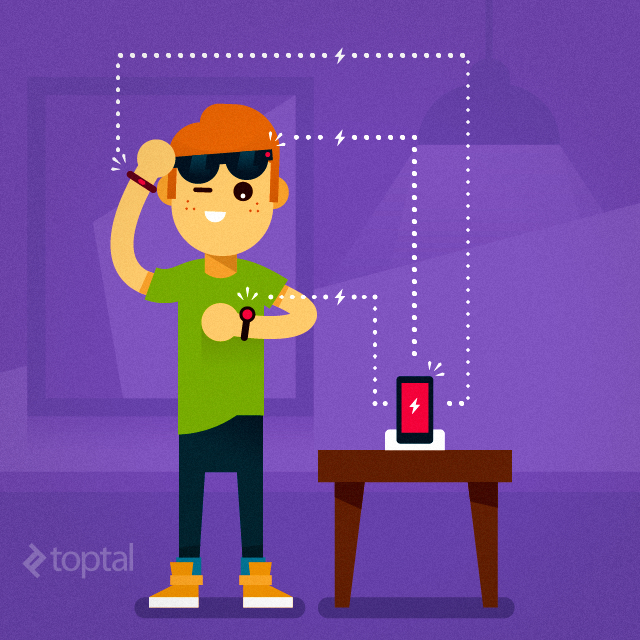 With so few users, this aspect of smartwatch app development is often overlooked due to cost and time considerations. Even so, it will become more relevant, so keep that in mind and get ready. Apple and Google will try to keep the process as simple as possible, but there is no harm in doing some research before a client asks for smartwatch integration. But what about the other issues I outlined? What about the stuff developers can’t fix? Pricing will remain a problem in the short run, but Android Wear devices should be commoditised quickly. Entry-level models will become much cheaper and we will see more stratification; not everyone needs a premium wearable device, and since we are dealing with disposable devices, most consumers won’t be willing to spend a fortune on them. Apple’s launch figures prove this. In the Android universe, this process will be much faster. At the moment, we have a single tier of Android Wear hardware, with basically the same hardware specs. Moving forward, we should start to see cheaper designs – rubber and polycarbonate watches for teens, premium stainless steel models for formal dress, ruggedized sports models, and so on. One interesting possibility is the use of modular designs. Manufacturers could move towards standardised casings and bands (which are already standardised); basically they could adopt a few different form factors for square and round screens, offering a range of different housings and modules that would be interchangeable. Why spend $1,000-$2,000 on a premium smartwatch if you could have a modular design that would allow the user to keep the fancy titanium or steel body, and simply swap out the watch module? You could use the same watch module in a $30 rubberized body, or a $200 stainless steel design. It’s also worth noting that Apple Watch and Android Wear are not the only two smartwatch platforms out there, but I will get to that later. Developers can’t do much about battery life and I’m sorry to say manufacturers can’t do a lot, either. The majority of smartwatches are basically scaled down phone platforms, Android Wear uses Qualcomm’s Snapdragon 410 System on Chip (SoC), while Apple uses its proprietary S1 module (not much is known about the exact spec). In any case, smartwatches are stuck with ~400mAh batteries that are supposed to power SoCs and screens. It’s simply not enough, so most Android Wear and Apple Watch users report 24-36 hour battery life. Even with more efficient next-generation SoCs on 14nm/16nm FinFET nodes, the screens will remain a problem. These are not mobile phones, designers can’t simply slap a bigger screen on the device and create a new form factor to accommodate a bigger battery. As far as developers go, limited battery life means efficiency will be more important than ever. Bluetooth 4.0 LE is efficient, so are other components, but optimisation will be the name of the game for years to come. This is a limiting factor since we won’t be able to harness all the capabilities of smartwatch hardware. Developing user interfaces with fancy transitions, animated wallpapers and similar eye candy features is pretty much off the table. Streamline the notification system, offer different intervals. Avoid memory abusing UI, or UI that places the GPU under a lot of load. Schedule as many processes as possible to run while charging. Limit awake times, use frugal wakeup system. Provide the user with a lot of efficiency-related options. Check battery status, create an ultra-efficient mode independent of system power management. Do your best to identify performance issues. Most of these tips are obvious, but are still important to keep in mind. A lot of people uninstall smartphone apps due to lack of optimisation; on smartwatches, this will be an even bigger issue. What About Alternative Smartwatch Platforms? So, my argument is simple – the current generation of Apple and Android smartwatches is overpriced and suffers from poor battery life. While they are not too expensive for consumers in developed markets, their pricing limits appeal in huge emerging markets such as Latin America, China and India. Prices of Android Wear devices are bound to go down, but there’s a limit; we are unlikely to see sub-$100 devices this year, and probably not in 2016, either. Apple doesn’t have a habit of cutting prices and I don’t think anyone expects the entry level Apple Watch to sell for less than $250-$300 next year. This creates an opportunity for alternative smartwatch platforms. There are a few billion people who simply won’t be able to afford expensive smartwatches. But do these alternative platforms stand a chance? Yes, many of them do, but it’s important to point out that some of them are not designed with affordable watches in mind. LG’s new smartwatch, designed for Audi, runs WebOS, but it’s designed as a flagship product, a tier above the company’s Android Wear products. Samsung’s Tizen-based watches have high-end aspirations as well. Personally, I find budget alternatives more interesting, and it’s not just about their broader market appeal – it’s about battery life. Asus recently announced the VivoWatch, a fitness oriented smartwatch design with a monochrome display. The company claims it can run for about 10 days on a single charge, trumping Apple and Android offerings. A number of vendors are working along similar lines; they are designing simpler and cheaper devices with superior battery life. This has more to do with chipmakers rather than gadget makers. Companies like MediaTek and Intel are working on such platforms; they wouldn’t be wasting their resources and burning millions had they not done a lot of research. They did, and they came up with the same conclusion as many observers – there is a market for cheaper, disposable devices with great battery life, including low-end smartwatches and smart wristbands, or just about any sort of wearable device you can think of. MediaTek, the world’s second biggest supplier of smartphone chips, launched MediaTek Labs last year, along with a couple of products designed for this market segment. The company is working both on Android Wear chips, such as the MT2601, and more frugal chipsets like the Aster MT2502. The first products based on the latter are hitting the market, and the platform has a few things going for it. The MT2502 is based on a tiny ARM7 EJ-S core clocked at 260MHz, and is woefully underpowered compared to Android Wear devices. However, that’s sort of the point. MediaTek designed a platform for affordable wearables with good battery life, so the first watches based on this platform have a battery life of about 5-7 days. They usually ship with lower resolution colour screens (240x240px), and the software behind them is called MediaTek LinkIt, which is essentially an MCU operating system. Since this is a relatively new platform, MediaTek is eager to get software and hardware partners on board, which is what MediaTek Labs is all about. The company offers a lot of support to partners and developers interested in its platforms – HDKs, dev boards, APIs, SDKs, and integration with Eclipse are worth mentioning. The company pointed out that its goal is to bring wearable devices to billions of people, which is not something Apple and Google can do with their wearable platforms, at least not yet. The first smartwatches based on MediaTek’s platform started shipping a couple of months ago. In spite of the low price, ranging from $60 to $80, these smartwatches still offer a lot of functionality. They can monitor the user’s heart rate, display notifications, caller ID, sync with media players, integrate with phone dialers and act like a smartphone camera viewfinder. 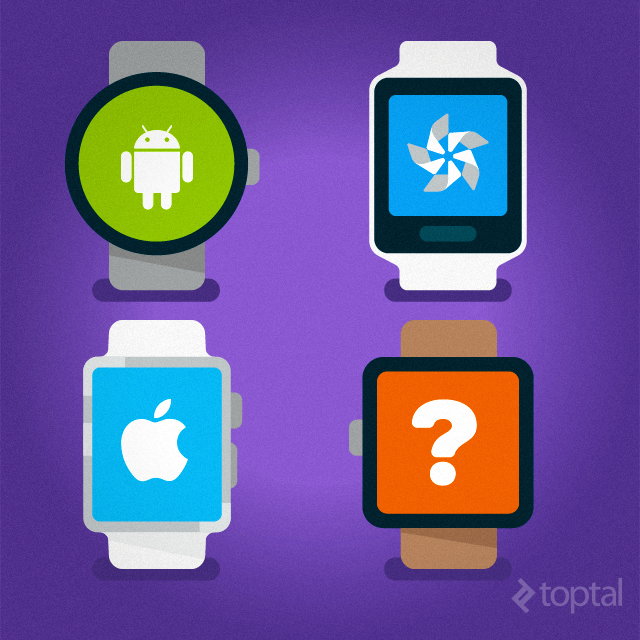 Which Smartwatch Platform Should Developers Focus On? There is no easy answer, as all platforms have something going for them and none can be dismissed at this point, so let’s take a look at some basic smartwatch pros and cons from an app developer’s perspective. It is Apple; it will sell. Single platform to deal with, no fragmentation. Potentially more lucrative than competing platforms, especially in the short term. Limited user base and long-term growth potential. Prohibitively expensive for many markets. Potentially much bigger long-term user base compared to Apple. Easy to add support to Android apps. Fragmentation (not nearly as bad as Android phones though). Round and rectangular form factors. Google needs to do a lot more development of its own. Much lower pricing with global appeal. A lot of long-term growth potential. Leaner OS; much better battery life. Possible use of identical platforms in more product categories, IoT. Virtually no user base and products for the time being. We have to wait and see how they will do in the market. 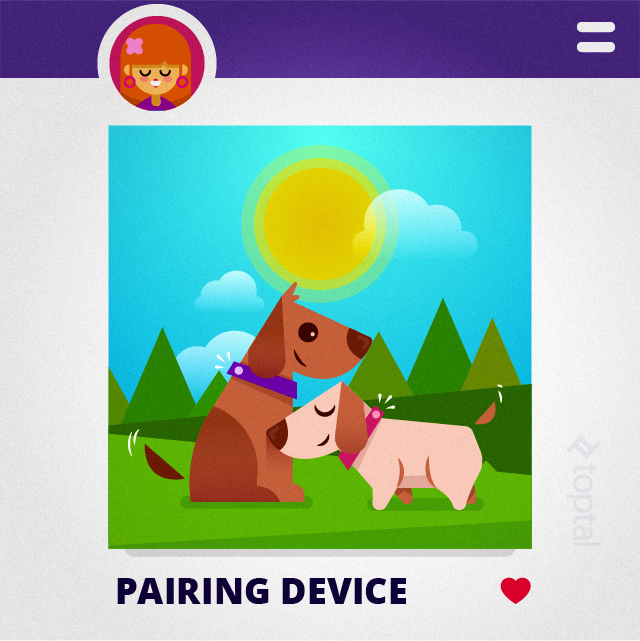 Compatibility and interoperability will remain a concern, since we are dealing with a number of different hardware and software platforms. Unlike many other Bluetooth accessories, smartwatches may not be compatible with different platforms, yet they cost much more than a wireless headset or Bluetooth speaker. I strongly believe it is too early to dismiss any of these platforms; all of them will evolve to cover different niches and price points. Unfortunately, it will take a while before we can get a clear picture of the state of the smartwatch market. No mention of pebble? Come on!! doesn't that count as a smart watch? It's sometimes disappointing to realize Apple sets the industry back in time and tries to prove earth that's what progress is all about. When iPad was launched it was a big sized iPod or iPhone & that set standards for a tablet of other manufacturers. But the right evolution of tablet should have been come by minimizing laptops like Surface Pro did. Anyways, It's apple, We have learnt to pay our endurance as price...It's funny to hear that Apple Watchkit App doesn't support animations and you need to supply pre constructed images of all frames. Way to go.